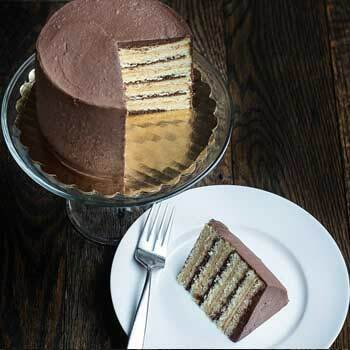 Our wildly popular, made-from-scratch Chocolate and Peanut Butter Smith Island Cake now available in a smaller size! Featuring layers of moist yellow cake, and alternating layers of fudge frosting and peanut butter, the cake is approx. 6" in diameter, 3.5" tall, and yields 7-9 slices. Like all SIBC products, it is shipped frozen with dry ice in a gorgeous, recyclable box.